2018 NEW 1:50 ERTL *JOHN DEERE* 3156G PROCESSOR *PRESTIGE* NIB! ERTL 1:87 HO SCALE *JOHN DEERE* Model 310SE Backhoe Loader HIGH DETAIL NIP! THE COVER FEATURES A STERLING DUMP TRUCK FROM THE 1950 ERA. It has 24 pages that are printed on both sides for a total of 48 pages. THE MODEL WAS MADE IN 1961. 1:50th Scale, John Deere Model 3156G Processor! NEW FOR 2018! PRESTIGE COLLECTION . All are in pretty rough shape. Up for sale the AMT Ertl Caterpillar D8H Crawler Dozer Tractor Plastic model kit is new in box, factory sealed. Item will make a nice addition to your Construction Vehicle Collection! See pictures for more details, feel free to ask questions.. Check my other Ebay Sales for more quality Danberry and Franklin mint classic car replicas... Ground Shipping in the US is 12.00. International orders use the eBay Global Shipping Program. Thanks for Looking! Condition:slight loss of paint; othewise very good. ERTL Bobcat Loader diecast 1:32 S300. AS you can see from the photos you are buying an original used condition toy! Look at the photos to see dirt or scuffs or dust or paint knocked off of it whatever might be on it from years of play and then in storage! I do not see anything missing from the toy, the small rubber exhaust muffler is shown with it, ALL show in VERY nice original condition. Overall it is a GREAT piece! AS you can see from the photos you are buying an original used condition toy! Model 332G Skidsteer Loader. 2018 Release! Diecast Construction. Great Detail! Condition: New in Box – Only taken out for pictures. RARE, Vintage 1/64 Caterpillar utility truck on card! FREE shipping! Here is a 1:64 scale Caterpillar utility truck. This is a VERY hard toy to find! The truck was made by ERTL in 1991. These toys move in all directions intended and the backhoe, bucket, hoe and landing gear funtion just fine, are actually nice and tight and not worn. Each features respective seats and the backhoe seat moves from front to back operation nicely, smoke stacks/mufflers and decals all present. This is a Ford 641 Workmaster Tractor with 725 Loader. It was made by Ertl and is 1:16 Scale. It is number 6 in the original Precision series. It is in good shape. The box is showing a LOT of shelf wear. This is a toy replica of the Case construction TV380. The arms move up and down and the bucket tilts. This unit fits in nicely with your other 1/16th toys, or as a display on a shelf. • LITTLE BUSTER. 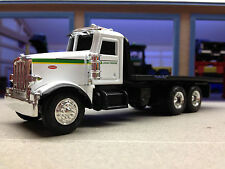 Item for sale : Ertl Mighty Movers IH Hauler 350 Dump Truck #1852. Made in Hong Kong by Ertl 1980 Era. Sold as shown in the many photos above. Fast replies! Scale is 1/16 and Ertl # 1759F. from the 1999 TOY TRUCK'N CONSTRUCTION SHOW. Backhoe swings and extends. New in box dated 1992. Front scoop raises and lowers. Stabilizing pads lower. John Deere Model 544L Wheel Loader. 1:50th Scale, ERTL Made. PRESTIGE COLLECTION High Detail! ERTL International T-340 Crawler w/Bullgrader 1998 1/16. Box has some wear. A couple of years have been taped. Thanks for looking. Global shipping used for International buyers. Please remember to leave feedback. Thanks. This is an early diecast Caterpillar D6 Dozer from a toy collection. This detailed model was made in USA by Ertl or Eska in the late 1960s. Note: the blade inner lift lever appears to be re-painted. SHOWS SIGNS OF SLIGHT NORMAL WEAR AND TEAR WITH THE EXCEPTION OF THE BACK STRAP THAT IS MISSING. AS SEEN IN PICTURES CURRENTLY USING RUBBER BAND IN ITS PLACE. John Deere Model 948L-II Grapple Log Skidder with Duals. 1:50 ERTL Prestige Collection Diecast. 2050M XLT Crawler Dozer. • LITTLE BUSTER. Case Construction. • SPEC CAST. • SCALE MODELS. This is an early diecast Caterpillar No. 12 Grader. This detailed model was made in USA by Ertl in the late 1960s. The model is basically new in the box, however the box is in poor condition. Great collector's item and quality toy! 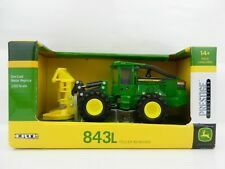 John Deere 440 Crawler Tractor 1/16 Ertl 2005 Toy Truck'n Construction Show New in unopened box. 1/50th scale in mint condition in original box. Box shows little shelf wear, A must have for that Hitachi or Construction toy collector. Estate sale find. Please look at all pictures for condition. Comes with what you see in the pictures. Ertl Hough International Payloader 1 Vintage Diecast Collector Model Made in USA. Condition is Used. Very cool as rare collector piece. There is patina and signs of play but doesn't appear to have rust. In perfect shape this item goes for hundreds. 100% of our profits are donated to children's cancer charities in memory of Will and to support Hailey's fight. Our goal is to give our customers great products while supporting heartwarming and deserving charities like the Chelsea Hicks Foundation, that we make a monthly donation to. 1:32 Scale, ERTL Made. John Deere Model 544L Wheel Loader with Forks. 1/25 Vintage International TD-25 Crawler W/Blue Box! This would make a nice addition to that IH collection. TOYS ARE IN MINT CONDITION IN THE ORIGINAL BOX, VERY RARE, BOX HAS LIGHT SHELF WEAR, 1/64th SCALE. TOYS ARE NEW ON THE CARD. Caterpillar 5080 Shovel - "Collector Edition". Made By : Ertl. Limited Edition, Only. Condition: Mint In Box - Box Has Been Opened. Material: Diecast. I do not see ertl on it anywhere,, I do see made in usa on the bottom of the head combine is complete with both drive chains, moveable auger, steel reel head, "narrow" canvas ALL show in VERY nice original condition. Ertl OMC Mustang Skidsteer has free rolling wheels, and arms that move up and down. Cage is plastic; wheels are rubber. The Ertl OMC Mustang Skidsteer is yellow and black. ERTL OMC MUSTANG SKIDSTEER.